The new parking lot at El Centro is open on the future site of a new development. Photo by Wendi Dunlap. public. Parking rates are listed here. 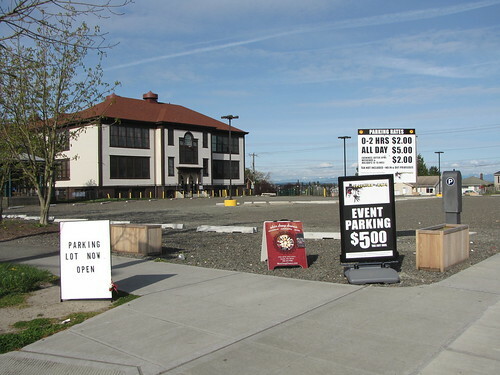 The lot is in the south part of the El Centro site, directly adjacent to the Roberto Maestas Festival Street, across the street from Beacon Hill Station. The parking lot is an interim use of the site, limited to three years or less, after which El Centro plans to develop the site. Proceeds from the parking lot benefit El Centro’s human services and community building programs. Mayor McGinn recently led a delegation to Chongqing and Beijing, and while there distributed some Seattle souvenirs to local schoolchildren — including a Beacon Rocks! t-shirt. Now that the egg hunts are done, are you wondering what to do with all those plastic eggs? Jefferson Community Center is the place to bring them. We are recycling eggs! Bring them in and give them a good home. We can use them again. Thank you. Maple Elementary School art teacher Kate Baker was recently featured in the Seattle Times in an article about arts programs at Seattle schools. The El Centro parking lot is a great interim use that will help fund some of their good work. I had a friend from the eastside park there, we connected at the Light Rail Station for the Sounders last Saturday. Very nice. How about using the parking lot as a space for a Swap Meet one day a week? Saturdays or Sundays during the summer. El Centro could charge for spots.